Welcome to this custom designed, custom built, charming Dutch Colonial home being offered for sale for the 1st time ever. It's easy to tell that this home has been loved, from its curb appeal and beautiful 1.3 acres of landscaped gardens, yard and flowering spring trees right into the front foyer where you immediately feel the calm and comfort of country living. Off the foyer, to the right, is the spacious living room which features a floor to ceiling stone fireplace, hardwood floors throughout the house, and a bay window with deep window sills. To the left of the foyer, is a generous sized dining room also with a bay window and deep window sills, a spacious kitchen sure to please every cook, a full walk-in pantry with lots of storage space and laundry area. Near the kitchen you can access the side entry and a convenient full bath which is close to the yard and patio deck area. Next to the deck is a garden area and koi pond to enhance the tranquil and peaceful feeling. Perfect floor plan for ease in cooking and entertaining both indoors and out. The custom built wood staircase leads from the living room up to a spacious full bath and 2 extra large bedrooms. The master bedroom has a walk in closet; both bedrooms and hallway have hardwood floors. 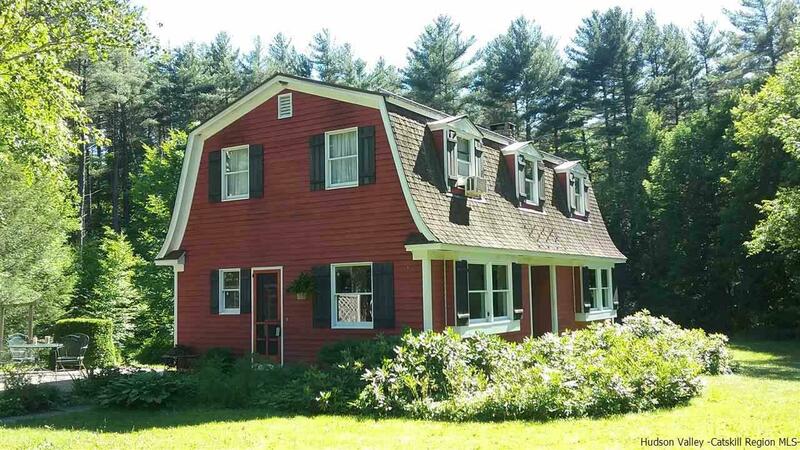 This home is conveniently located not far from the best little town of Phoenicia and only about 15 minutes from the eclectic town of Woodstock. Enjoy summer stock plays and shops in Phoenicia and the Saturday flea markets and farmer's markets in Woodstock. Minutes to Belleayre or Hunter Mt. ski slopes, Restaurants, and your choice of many favorite outdoor activities from hiking, tubing, fishing, biking, to outdoor concerts and more; all close by. The over-sized garage with storage area is another plus. For our city friends, catch a Trailways bus, get off at the 4-corners stop in Mt. Tremper and it's only about a 5 min. walk home; have your car in the garage waiting for your arrival . Come see this delightful home and enjoy its warmth and charm and the beautiful mountain views and sunsets. Lot Block Address: 3&4,1,1521 Wittenberg Rd.